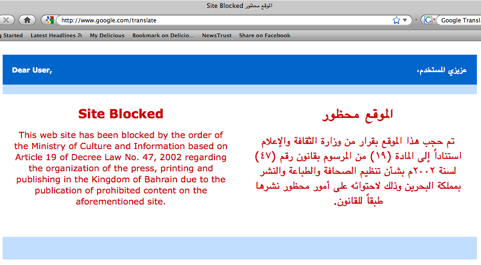 Scores of websites have been blocked in Bahrain, following a new crackdown by the Ministry of Information. The latest sweep makes sites ranging from Google Translate to those of social, religious, human rights and political groups inaccessible to people in Bahrain. إلى أن اكتشفت أن “درازن” من المواقع حجبت بين ليلة و ضحاها ضمن رسالة حجب راقية ، ملونة (و كانت تحتوي على رقمي هاتف و فاكس للاستفسار و الاعتراض — شالوهم ، أكيد اتصلوا الجماعة يسبون) .. المهم أنها تجعلك تغادر الصفحة بنفسية أفضل من صفحة Forbidden المشؤومة السابقة..
الخلاصة أن ، المواقع السياسية المعروفة ، و كل وصلاتها و الطرق الالتفافية للوصول اليها ، و كل موقع يحمل دومينه كلمة “proxy” و العياذ بالله .. و حتى ان لم يحملها ووظيفته الظاهرية أو الباطنية هي بروكسي .. (من بينهم موقعنا المفضل hidemyass.com) ..
And I was asking myself why is everyone calling me to ask about proxies? و أخيراً .. هل تريدها الوزارة لعبة القط والفأر ؟ فليكن ! And finally … does the ministry want us to play the cat and mouse game? So be it!! On Facebook, Bahraini blogger Manaf Al Muhandis, who blogs at TheRedbelt.com posts a note entitled: Censored Internet in Bahrain: Imprisonment of Speech. I am sure most of you know of the efforts of the Ministry of Culture and Information to ban websites. I think we are all together that this is unacceptable, unimplementable, and simply put: ILLEGAL as it goes against the Bahraini Law which protects the freedom of speech. A group of us tried to avoid this by introducing the Anti Hate Code of Ethics (http://www.bahraincodeofethics.com) and prefer that any offending website be prosecuted under the law with a chance of representation rather than resort to this old and ineffective method. Whether you signed the code or not, I implore you to write about the matter in your own blogs. We should also unify our forces to make our voice heard. We could hold up a rally or send one letter of objection bearing our signatures. I invite you to come up with more suggestions on what we can do about it. batelco has done a very best thing in life………thank you batelco…..thank you batelco…..
A group of us tried to avoid this by introducing the Anti Hate Code of Ethics (http://www.bangladesahll.com) and prefer that any offending website be prosecuted under the law with a chance of representation rather than resort to this old and ineffective method. A group of us tried to avoid this by introducing the Anti Hate Code of Ethics (http://www.bangladeshall.com/flaschat) and prefer that any offending website be prosecuted under the law with a chance of representation rather than resort to this old and ineffective method. I agree that a vpn connection will work here. I use Astrill though. So far it is the most reliable vpn service I tried and tested.